Layering lighting is a concept of using a variety of different lighting techniques within a single space at the same time. Doing so successfully will provide depth and character to the space, making it more pleasing visually and inviting to be in. Each singular lighting technique will illuminate a particular zone or feature, but combined together, the final result is truly greater than the sum of its parts. 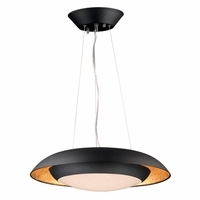 The most commonly used lighting techniques are general, accent, and task lighting. Let's break down each one in this example kitchen application and see what the effects are. 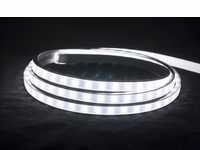 General lighting, also called ambient lighting, provides the overall illumination of a space. It does not focus on a particular feature or task. 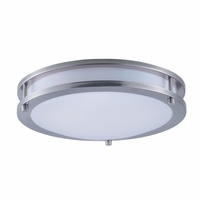 It merely blankets the entire space with light, usually from the ceiling in the form of downlights, troffers, or surface-mounted fixtures. 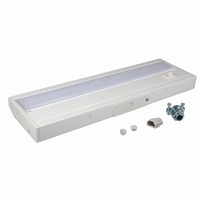 In the above image, the LED downlights in the ceiling provide the ambient lighting (all other lighting is turned off). The light level in the room is sufficient and the floor is adequately lit. The careful positioning of the downlights also do a nice job of washing the front surface of the white upper cabinets with light. However, there are some dark shadows present along the back edges of the countertop and in the corners. 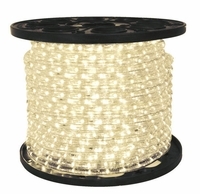 Accent lighting is a popular technique for providing some visual interest in a space. It can be used out outline objects, create ambiance to set a mood, or provide subtle illumination in the periphery of your vision. 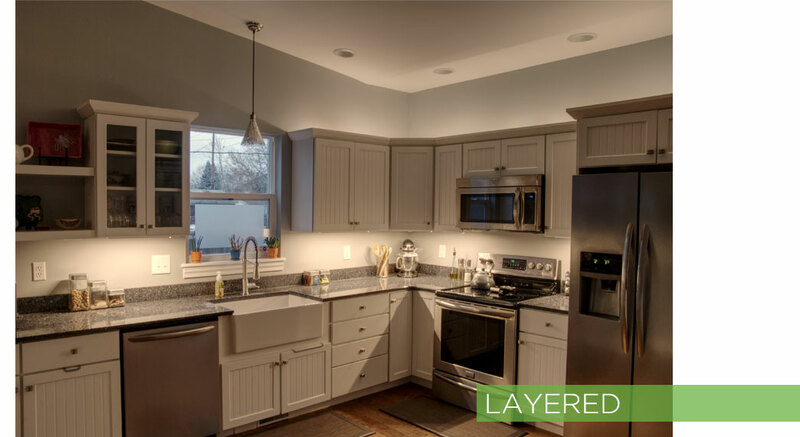 In the above image, linear LED hybrid light is placed above the upper cabinets (all other lighting is turned off). While this does not illuminate the rest of the room or work surfaces, the subtle uplighting effect created does make a visually interesting statement and attracts the eye. Task lighting is the direct and purposeful illumination of a work surface in order to provide ample illumination to accomplish detailed tasks or jobs. 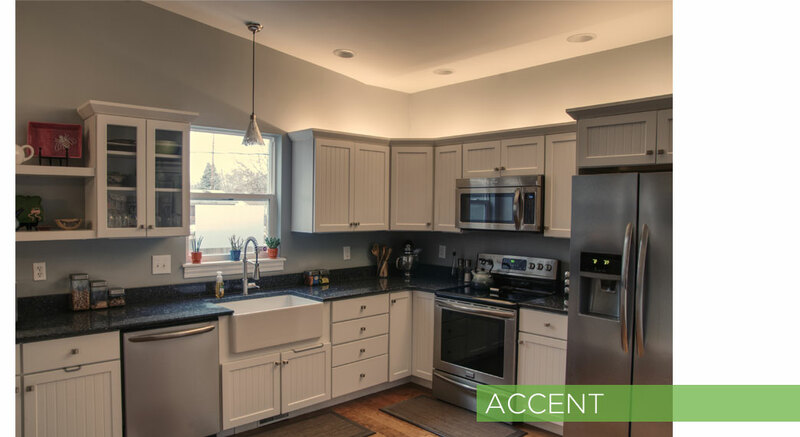 In the above image, LED under cabinet lights have been placed under the white wall cabinets in addition to the the hanging pendant suspended above the sink (all other lighting is turned off). 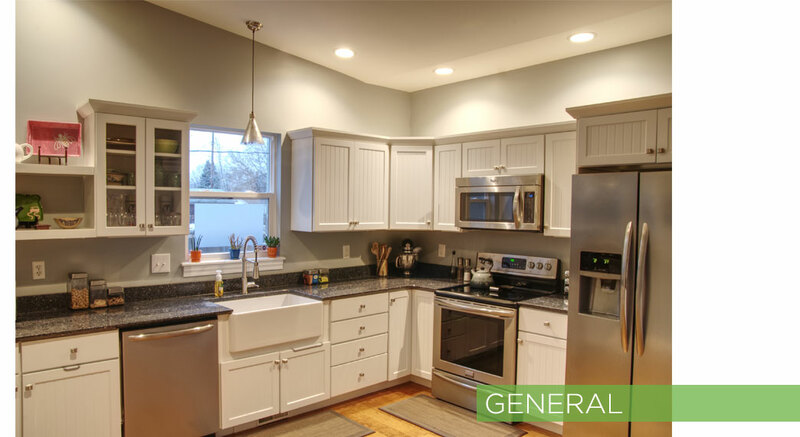 While the general lighting provided by the downlights previously provided some illumination of the countertops, it was not enough and left many shadows. 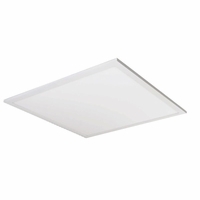 For chopping vegetables or reading recipes, we need a lot more light than just what the downlights provided. 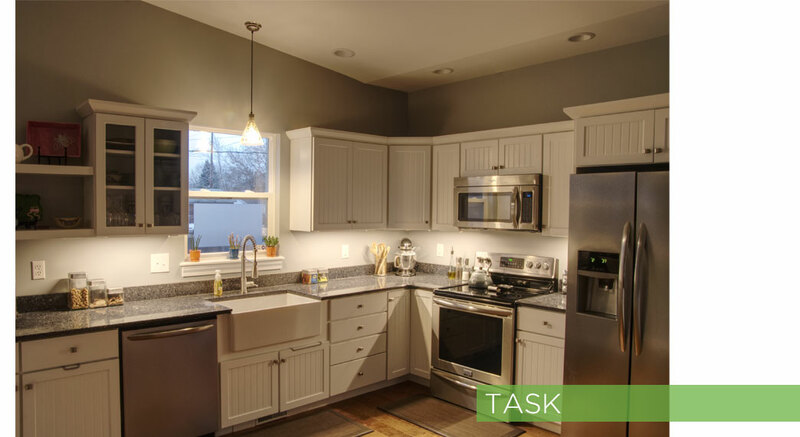 Here, we can see that the task lighting provided by the dedicated under cabinet fixtures and the pendant light provide an abundance of light on the counters. They are bright, evenly illuminated, and present no shadows on the counters. Let's put it all together; turning on all the different lighting techniques at once and see what the result looks like. Now we have a kitchen that really pops! 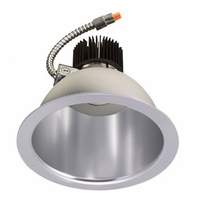 Downlights provide overall illumination of the room. 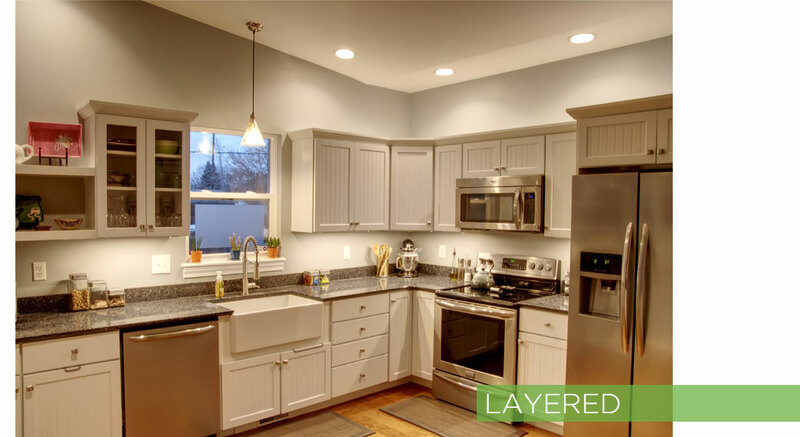 The tape-rope hybrid light accent brings the upper wall cabinets to life. And task lighting floods the work surfaces with light. When most people try to light a space, they only think about the general lighting, which can leave a room feeling flat and lifeless. Adding layers of light brings the space alive, giving it depth. An important note: Shadows and darkness are an important part of lighting design; just as important as the light itself. In order for light to stand out and be visually interesting, engaging, and to elicit emotion, it must contrast with shadows. Notice how not every crevice and corner of this kitchen is fully lit. It's critical that all light have darkness to "pop" against. Of course, you don't have to have ALL the lights on to get the effects of layered light. Here we've only turned on the accent lights and the under cabinet task lights. The pendant over the sink and the LED downlights in the ceiling are turned off. It's a completely different effect, but still very visually pleasing. It's a great option for sunny days when sunlight fills the room and you don't need to waste the energy of the downlights, or late at night when you're getting a snack and you don't need to be blinded with ambient lighting...a little task and accent lighting can go a long way! 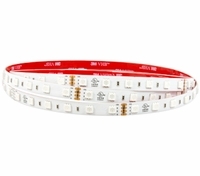 Contact us today and let us assemble a custom quote for LED lighting fixtures for your entire project.